The program involves local community partners in developing and organizing an awareness presentation that is hosted by local secondary schools. Partners include youth, people with mental illness and their family members, clinicians, teachers, mental health and other agency representatives. The presentation includes information on mental illness and stigma and also includes presentations by consumers who are experiencing mental illness in their lives. What are the goals and objectives of the program? 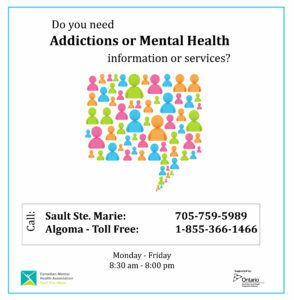 The Centre for Addiction and Mental Health, the Canadian Mental Health Association Ontario Division and the Mood Disorders Association of Ontario have worked together to develop this community-based awareness program for youth aged 16 and older. For more information or to book a presentation, please call the Mental Health Educator at 705-759-0458 ext. 231.